This is from Yotam Ottolenghi and Sami Tamimi’s book Jerusalem. It is crunchy and refreshing. I added some chopped celery to make the salad go further but it would also be easy to scale down the dressing ingredients to suit the amount of kohlrabi you have. For those of you who live local to Wadebridge, sumac can be bought at Elixir Health Foods at the top of Molesworth Street. 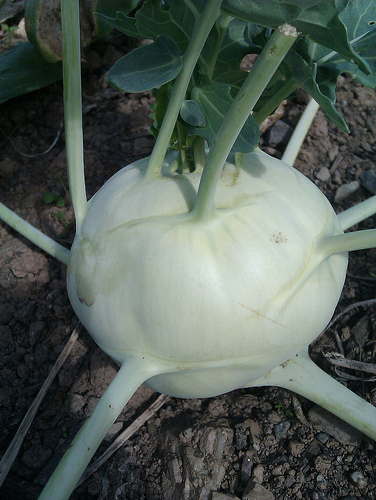 Peel the kohlrabi, cut into 1.5 cm dice and put in a large mixing bowl. Put the yoghurt, soured cream, double cream, garlic, lemon juice and olive oil in a medium bowl. Add 1/4 tsp salt and a healthy grind of pepper and whisk well. Add the dressing to the kohlrabi, followed by the fresh and dried mint and half the watercress. Gently stir and place on a serving dish. Dot the remaining watercress on top and sprinkle with the sumac.